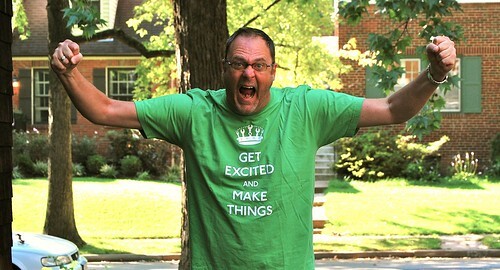 GET EXCITED AND MAKE THINGS!! !, originally uploaded by dgray_xplane. After years traveling the world in airplanes to speak at sustainability events, my low-emission online alternative is now available. In recent weeks I was compelled by a family matter to substitute my physical presence with a virtual one in Austria, China, Canada, the USA, and Brazil (Curitiba and Rio). These online encounters have a simple format: I make a customized-for-you 20 minute pre-recorded talk, which is downloaded in advance; this film is then shown at an event; this is followed by a live conversation between me and your group via Skype or POTS (Plain Old Telephone Service). The films are neither fancy nor glossy, but this simple combination seems to work well. It occurs to me though, that part of the pleasure – and reward – of travel to conferences (apart from the well-documented serendipity of what happens outside of the scheduled sessions) is the chance to visit a new city and experience it’s culture. Often, if you are lucky, this is in the company of locals that you have met at the conference, who will show you ‘their’ city rather than the official version. I wonder if John has considered asking the those locals at the conferences he will ‘attend’ via video, to send him back a 20 minute customised-for-him film of their city or town? 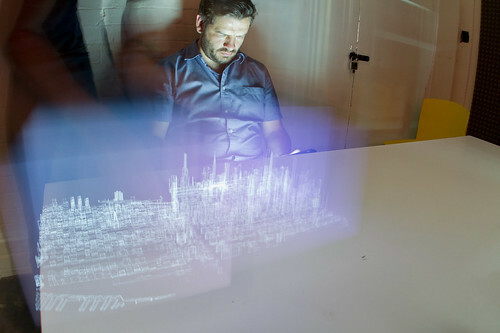 Matt Jones and the city iPad light painting, originally uploaded by BERG Studio. Here I am sat like an rumpled, bearded stooge while it seems a city is carved with light from a block of aerogel in front of me. Insanely-proud of being even peripherally-involved in this piece of work from Timo, Jack, Cam, Matt B., and Beeker. Shipping Forecast Rosary in October 2010 edition of Icon, originally uploaded by moleitau. Which is really nice. I have a lot more work to do on it before it’s ready to sell, but prototyping in acrylic this month.